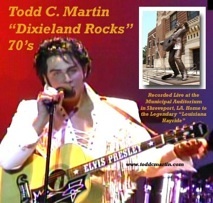 Filmed live at the Monroe Civic Center on June 12, 2010. 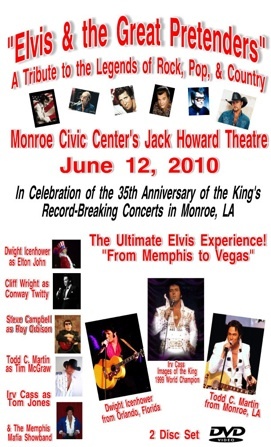 Show features Dwight Icenhower as Elton John and Elvis, Todd C. Martin, as Tim McGraw and Elvis, Irv Cass as Tom Jones and Elvis, Cliff Wright as Conway Twitty, and Steve Campbell as Roy Orbison. Run time is approximately 3 hours. 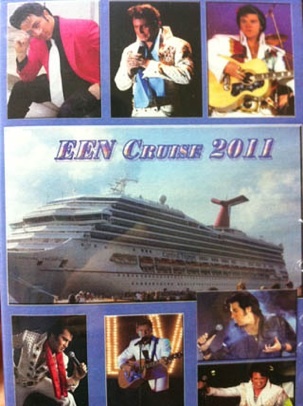 A set of 8 DVDs, with 16 hours of recordings, includes all 12 hours of on-board performances, shore excursions, and a photo slideshow. Cost of the set is $65 plus $3 convenience fee and $5 shipping. 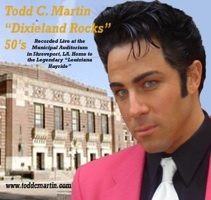 Performers on this DVD set include Dwight Icenhower, Jesse Aaron, Brandon Bennett, Todd C. Martin, Matt Joyce, Joe Hall, Terry Price, Ryan Roth, and Ronnie Craig. 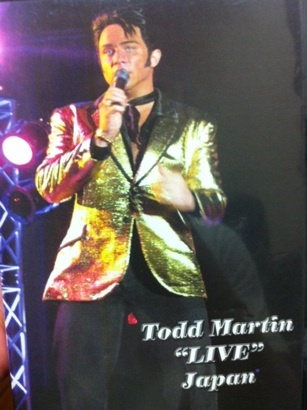 A set of 3 DVDs and 1 CD, that feature the full shows at all of the tour locations in Japan, sightseeing, and a CD of the best of Japan. Cost of the set is $55.